We have had the benefit of a wonderful rain year, and watering may be the furthest thing from our minds. 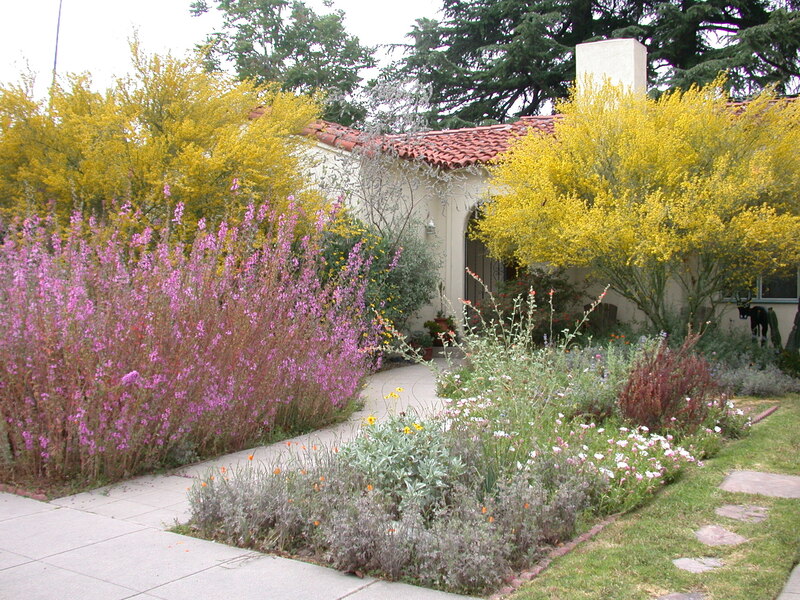 But knowing when and how to water native plant gardens is a key to success. A new Tree of Life Nursery publication, Watering Native Plants, by nursery co-owner Mike Evans, covers important factors to keep in mind while planning – particularly for rain capture, and for decisions about irrigation methods. Mike is an advocate for bringing back the human factor in watering gardens and in irrigation of commercial landscapes. The concepts and practical recommendations in this guide apply equally to commercial landscapes and home gardens. Click here to download a free copy of Watering Native Plants. Article and photos by Laura Camp. Wow. I couldn’t have said it better myself. The Los Angeles Times said, “Los Angeles would no doubt be better off with less turf. But not if we replace it with gravel or plastic.” This is an important point. A few years ago a friend mentioned that he was going to replace his lawn with plastic grass. Incredulously, I asked why. He said, “Low maintenance, no watering.” I explained that covering his yard with plastic was by no means a benign environmental action. I mentioned the lack of groundwater infiltration, elimination of habitat for native animals, and the reality that the plastic lawn will begin to look tawdry in no time and will have to be replaced- with all that plastic ending up in a landfill. Speaking of the birds and the bees, in an editorial titled, “Don’t give native bees short shrift,” the Los Angeles Times states that, “If the goal [of a proposed beekeeping ordinance] is to strengthen the bee population…the best strategy is to give residents incentives to grow more flowers and avoid treating them with pesticides.” The editorial goes on to state that, “Research has shown that farms would need to make only modest changes to attract healthy numbers and varieties of the local pollinators.” They suggest hedgerows of native plants. Of course, this strategy works in the residential setting too. 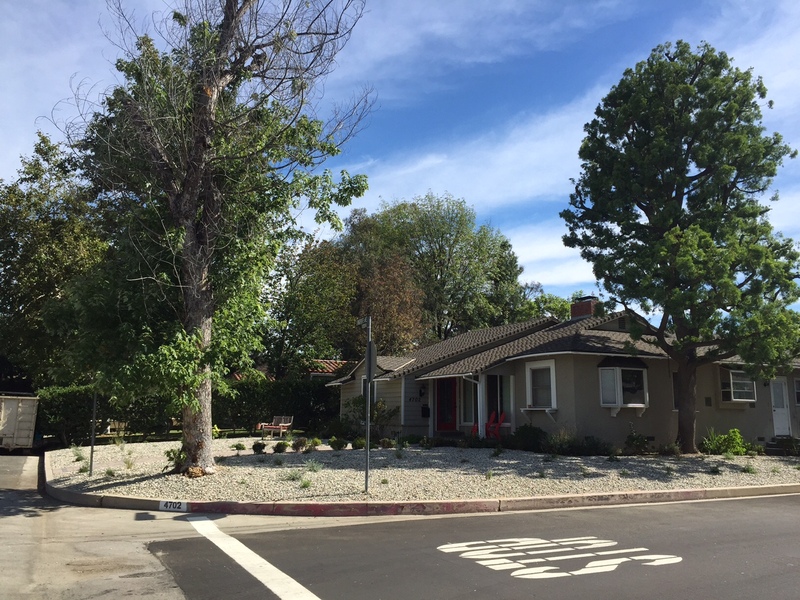 As a Los Angeles resident who has been driving around and seeing the results of various interpretations of “turf replacement”, I am concerned with the cactus gardens and gravel front yards that have only a few plants poking out. Importantly, as Thomas D. Elias in an editorial in the Daily News pointed out: plants help combat climate change by pulling carbon out of the air and facilitate the recharge of ground water. 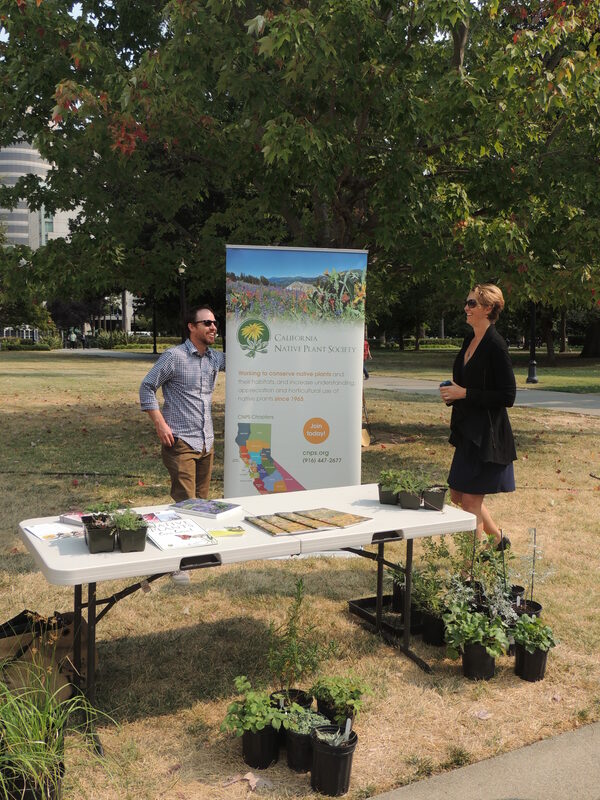 With all the newspapers jumping on the band wagon supporting the use of native California plants, it seems that CNPS has won an important battle – native plant landscaping is no longer a fringe activity; indeed it may be one of the important tools that will help Los Angeles cope with drought and climate change. However, the war has not been won until heavily watered lawns and landscapes have been replaced, not with gravel and plastic grass, but with native gardens filled with birds and pollinators. Steven L. Hartman is a native plant enthusiast, avid gardener, desert fanatic, and President of the California Native Plant Society. 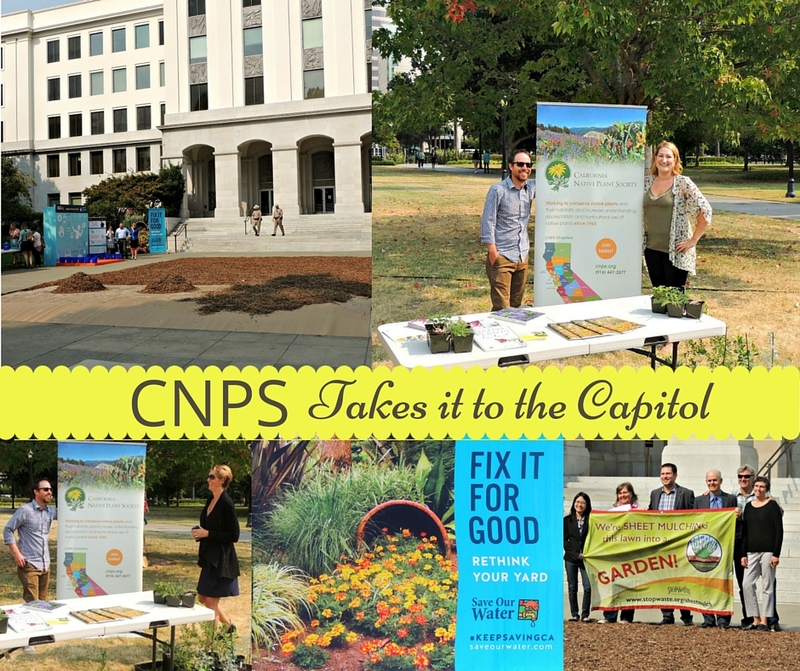 He has been a CNPS member since 1974 and a CNPS Fellow since 2005. 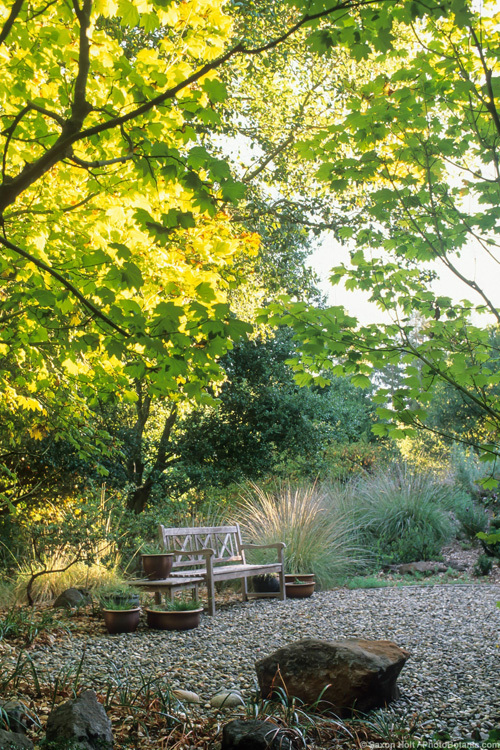 Summer-dry, drought tolerant, naturalistic, Mediterranean garden with California native Acer circinatum (Vine Maple). Photo by Saxon Holt.